Warm Christmas greetings from the Slobodians and all at BIEM! This month’s video update is a special treat as you will hear the choir from the Rock of Salvation Baptist Church in Kyiv, Ukraine while you view ministry pictures from this past year. This church is Ukraine's largest independent Baptist church and houses our seminary, which is a partnership between BIEM and the Brotherhood of Independent Baptist Churches of Ukraine. This particular choir has been a special blessing to all of us at BIEM over the years. 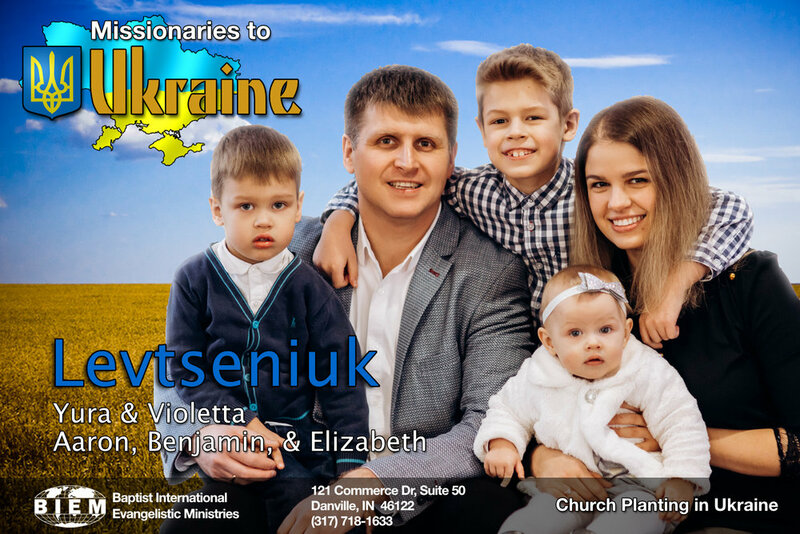 They have often traveled with us all over Ukraine to provide music for evangelistic meetings, dedication services, ordinations and other special events. One time they traveled with us all the way to Belarus. Please take the time to listen to this choir directed by Vitaly Grigor as they sing the Hallelujah Chorus. May God bless each of you with a joyous Christmas and wonderful New Year! When a sinner repents, Heaven rejoices. In our church, we too greatly rejoiced. Victor is a man for whom we have prayed a long time. He actively helped in building our church. He became the first person whose heart found peace in Christ after many years of wandering in darkness. Victor came from the world, from a non-Christian family. All of Victor’s life passed without the Lord; therefore, when he repented that was a special event for us. Tears of joy welled in our eyes. We sang hymns of praise and thankfulness. The whole church got on their knees and gave praise to the Creator for this saved sinner. Friends and relatives wondered how it was possible he would no longer drink alcohol. They wondered if Victor had fallen into a cult. It takes courage to openly declare you’ve become a follower of Christ, that you want to change your life, especially when everyone around you is far from God. There’s a risk everyone will turn away and say that you’ve lost your mind. But Victor had thought through his decision with regard to the Gospel and Christ. He openly said: “I am a believer. I no longer drink!” Thank God for his decision and courage. This was the first fruit of his repentance. His wife’s new, softened attitude is a huge answer to prayer. Fellow church members in Ukraine were praying, and so were Americans Victor had met when they visited Bilogorodka to help with the church’s construction. People on both sides of the ocean prayed fervently. There will be more trials in Victor’s future. We are praying, and we ask that you, dear brothers and sisters, please support Victor in prayer, that the Lord be with him in all his paths and give him peace of heart. Thank you again to each of you who donated to BIEM’s church construction fund, which in turn led to Victor’s repentance. Saving sinners is the heart of ministry! This month's video update is from the outskirts of Moscow where BIEM church planter Pavel Rumachik established a drug and alcohol rehab center as a ministry of the church planted in Nahabino, Russia. Early in their ministry, so many drug addicts and alcoholics were reached that a pressing need developed for a program and a place to help these new believers who were struggling with addictions. They began right in their church building with a program that featured Bible Study, personal counseling, and physical labor. Eventually, they moved to the building in the video, which was largely built by the men in the program. This video features Pavel Rumachik speaking about this very successful ministry, which led to several other centers being established in other areas. Here is a story from our recent Challenger publication. When it comes to building churches, a major concern in most of the world is justifying the cost of a facility that’s used only a few hours per week. So, there are great advantages to buildings that are usable for more than worship services. Three of BIEM’s current construction projects are examples of buildings that multi-task for their congregations. Since most of you won’t have an opportunity to visit them, let us take you on a brief “tour” via this article. • Lodging for seminary students. • Guest quarters for attendees of conferences. To accommodate such specific goals, the plans were revised to include a full basement with eight bedrooms, restrooms with showers, and a meeting area, plus more rooms and restroom facilities on the second and third levels. The design included a kitchen and eating area. The result was a multi-purpose church building that could house 30–40 people. Long before the building was complete, the downstairs quarters were made available for seminary students, who were thrilled. These new surroundings provided a huge upgrade from the crowded housing situation they had previously endured. Since then, the building has housed mission teams, Christian refugees in transit from the war zone, and pastors who gathered for annual meetings. Due to the downtown location of this church, the cost of a stand-alone building was far out of reach. The solution, by God’s gracious provision, was to purchase the first floor of an apartment building. (This is an area most typically used for stores, shops, and other businesses in Ukraine.) The first floor that BIEM helped the congregation to buy includes two separate entrances besides the main church entrance. This large downstairs area makes possible multiple uses that dovetail with the church’s outreach to the community. For instance, church leaders immediately designated basement space to receive and store BIEM’s container shipments of humanitarian aid and ministry equipment. (We’ve already sent one shipment.) BIEM missionary Vitaly Bilyak plans to use another room in the basement as a youth ministry center. A separate entrance from the street leads to two separate rooms, one on the left; another on the right. As the church grows, these will be ideal for developing ministries such as a day-care center, food-pantry, or clinic. Any of these would enhance the ministry of the church and provide opportunities for evangelism. Since this community of over 200,000 people has had no Gospel witness (the believers there travel by train to reach the nearest church), this church-building project is the answer to the prayers of pastors and other Christians who have been praying for this city. A second prayer was that God would provide a church planter to shepherd this work. The church-planter God provided brought a big challenge. Brother Andrei, the experienced church-planter called to this work, has a huge family with thirteen children. Where are you going to find a home for so many people? Since blueprints for the building had yet to be created, the solution was to make a good portion of this church building a large parsonage adequate for this family. Amazingly, God provided a donor who offered a matching-fund gift large enough to push all three projects to the point of being able to hold services. As these three projects near completion, the last step is to finalize their interiors, including church furnishings and seating. Praise God! And as if that were not blessing enough, BIEM has now received another matching-fund offer of up to $40,000 to match whatever other donors will give toward Church Construction. Thus, if gifts from friends of BIEM add up to $40,000, then those funds will automatically double to $80,000 — enough to furnish these three buildings, plus provide a badly needed roof for the Soroon Women’s Shelter in Central Asia. Dear friend, if you would like to make a special year-end gift for Gospel ministry, this matching-gift offer will maximize your donation’s impact. To finish these jobs, simply designate your gift of any size “Church Construction.” May God bless these constructions, and may He save many souls in their communities! Warm Christmas greetings from the Slobodians! As we celebrate this special time of year in commemoration of God’s great gift of His son, we wish each of you a joyous Christmas and blessed New Year. As a family we have much to be thankful for. Looking over the past year we see that God has answered the prayers you have directed towards our family needs. Amy has fully recovered from her heart surgery one year ago and our grandson Shane Harvey has recovered from the serious concerns connected with the liquid build up around his brain we had mentioned a year ago without needing brain surgery. Shane’s older brother Noah who had the heart transplant still needs your prayers. Though he seems to be fine his doctors at the Children’s hospital have grown increasingly concerned about some of his lab tests that are a regular part of his life. Though they continue to run tests, as of yet they have not found out why the test results are so troubling. Please pray that they can find the cause of all this and that it is something that can be treated. Meanwhile he is not in pain or discomfort and is in fact a happy little boy even though his life is not normal with all the trips to the hospital and the feeding tube he is connected to most of the time. We are also rejoicing in the recent announcement our daughter Sharon and husband Ashton Brandyberry made that they are expecting their first child the end of March. This will be our 9th grandchild! This past year also brought some special ministry blessings. The 2500 children and youth attending our camps this summer was a record and the nearly 500 salvation decisions was rewarding for all those who labored and gave for this ministry. It was also a blessing to see the return of students this year from the war zone in the East at our training sessions in Kiev. The seven building projects started last year made significant progress over the past year and each one is complete or close to completion. As this year draws to a close there are some needs which need prayer. Please pray for our brethren in Russia who need wisdom and strength as they deal with the new anti-missionary legislation that has been passed. Authorities in Eastern Ukraine have also recently made statements against “non-traditional religious organizations“ which generally means anything other than Russian or Ukrainian Orthodox religions. Pray as well for brother Peter Rumachik as he continues trying to resolve the delay to getting gas to the new church building in Shahovskaya, Russia. Please pray that they may soon be able to switch from the expensive electric they are now using to the more economical gas. Thank-you for the prayers and support you send our way. We thank the Lord for your heart for His missionary work. May God bless you all! Tolik, son of BIEM missionary Nikolai Ryzhuk, underwent back surgery in Moldova in the last week of November. So far, recovery seems to be going well. Tolik was up and walking two days later. Praise the Lord for a Christian surgeon and for this report. BIEM praises the Lord for the provision of a $40,000 matching-funds program to push several building projects to some final stages of completion, including needed interior furnishings! Please pray with us that the $40,000 needed comes in. Pastor Andy Counterman, who is BIEM’s Field Director for Latin America, reports exciting progress among the young church planters there. Starting new churches is no breeze. Humanly speaking, it involves much time and energy. But God is blessing. One church is up to 55 people. Another up to 60. Another church planter is reaching native tribes in the jungles… May the Lord continue to bless the ministries of young men on fire for God! In Bila Tserkva, Ukraine, BIEM’s Bruce Tuttle speaks of his 10 Bible students and says he is “delighted with the developments that are noticeable in their fervor and Christian leadership character.” Such words remind us of the Apostle Paul’s pleasure at Timothy’s eager desire to grow in the Word and ministry. Praise God for such young men! In Goncharovsk, Ukraine, missionary Alexander Petrenko has organized a floor hockey club for schoolboys. In addition to the playing their sport, he has Bible lessons with them. He requests prayer for these young men to understand and embrace the Gospel. In Shahovskaya, Russia, Pastor Rumachik reports a bureaucratic delay that prevents hooking up a natural gas line to the new church building. This situation forces the believers to continue warming the building with electric space heaters, which is expensive. Please pray for a quick resolution to this delay. This month's video update is from Shahovskaya, Russia, a community of over 200,000 about 2 hours from Moscow. Shahovskaya is along one of the commuter train routes serving Moscow, and so many people commute this long distance to work a high paying job in the capital city. This video features church planter brother Andrei Udinseva who was recruited for this ministry by Pastor Peter Rumachik, the spearhead of this church planting project. camp, this time for special-needs children and their parents. We prepared diligently, and we were concerned, because this was a first for us. We held the camp 25 miles from Lutsk. We stayed in a two-story building with rooms for four, six, or eight people. On the first floor we held Bible studies and craft time. We ran the games outside and in the large hall where we had Bible lessons for adults. We had two puppet shows. One of those presentations was written and performed by mothers of the kids, and that was interesting. At the end, someone needed to summarize the show’s meaning and tie it to the Bible lesson, which Ludmila did. Later she told how hard her heart was beating, but then how “easy it was on her soul” when she’d finished She’s only recently begun to read the Bible. For her, praying before meals was new. She found the Bible to be a wise and interesting book; indeed it holds answers for all her questions. She asked how people can fully obey the Lord and also pursue their own plans and personal life? We spent a lot of time in conversation. Of course, leaders were busy with the children. To our surprise, all the children were obedient. I’m amazed by their openness, their smiles, and friendliness. Age-wise, some are no longer children, but mentally they are young. Our No. 1 rule is to talk to them normally, without pity, as if to ordinary kids. These special-needs children were so active in games. They read the Bible aloud, they sang, and they performed all exercises during morning calisthenics. This was exhilarating and instructional for all the children. They tried their hardest, even though it didn’t always work out. One boy, Victor, always ran to games and calisthenics. Some exercises were hard for him, but he asked his mom to help. His mother, Tanya, was delighted with her son’s camp experience. In camp, he opened up and laughed and was cheerful. At home he was reserved, grumpy, and fearful. How surprised she was when he joined in relay races and even knew how to be a good loser. She cried from joy that you revealed secret sides of her son, and that her boy felt what it’s like to be a needed part of a team, to be like everyone else. When there was a call to repentance, this boy lowered his head and prayed. His mom prayed, too. Some children misbehaved, and they deserved punishment. But Maksim (a leader) volunteered to take the punishment in their place, so he was swatted with stinging nettles. Afterward Maksim explained that Jesus died on the cross for you and for me to take our guilt on Himself so that we can have eternal life with God in Heaven. Andrei absorbed this lesson, and he prayed for forgiveness and salvation. His mother, Elena, works at a school. She has no spare time for training her son. Now, at the end of camp, she seriously wants to fellowship with us. She has seen God at work in her family, and that only He can help her cope with her son. Luba and her granddaughter Inna, 16, had never been in a camp. (After Luba’s daughter gave birth to a disfigured daughter, the daughter’s husband left them. Luba’s daughter cried for a long while; then she gave Inna to her mother before she, too, departed to start a new life without the disabled daughter.) Luba has raised and schooled her granddaughter at home. Luba told how it hurts that Inna has no friends. When Inna was an infant, it hurt to take her outside. Everyone stared, and children laughed at Inna. Physically, she’s 16, but her mental age is half that, so she has no friends. Inna reads the Bible, and in this way she uplifts herself. It’s a little hard to understand her words, but she reads confidently. In camp she read verses to all of us — and she was happy. Thank you, friends of BIEM, for caring and for giving to make many, many camps possible. Your love is touching lives for Christ! God has answered prayers for our national worker Barnabas, who suffered injury after his truck slid on ice and rolled over 3 times. His vehicle was totaled. Less than 3 weeks later, he is joyfully reporting he is feeling “fully recovered.” He wants people to know how grateful he is to God and how thankful he is for amazing prayer partners. Our coworker Barnabas lost control of his car when he drove over a patch of ice. Injuries from their accident resulted in the left side of his body being in pain. He is unable to get treatment at the local hospital because there is no electricity in the area. Please pray that Barnabas will be able to receive the medical attention he needs. At last, the new church in Bilogorodka, Ukraine, has begun holding services. The first service filled the church because it was a special Harvest celebration service. Many guests from other churches attended, including an entire choir. The next week 22 people attended. May God bless and grow this brand-new ministry! Last month we requested prayer that tensions in east Ukraine’s war zone wouldn’t hinder students from attending the Fall session of the seminary in Kyiv. Praise God, after no students from that region for over a year, some students from the East resumed attending. There were 6 students from the East this current session. Good news from the Republic of Georgia: over 100 people attended an evangelism event, and God blessed with salvation decisions! Plus, students from India who attend the medical university in Tbilisi have discovered the international church. Nine of these have trusted Christ! Praise God that Brother Andrei, a Russian church planter recruited by Pastor Peter Rumachik for the new work in Shahovskaya, Russia has arrived and begun his ministry. This was no small task since they moved from faraway Siberia and have 13 children. Tolik, one of the sons of missionary-pastor Nikolai Ryzhuk in Drogichin, Belarus, is experiencing serious recurring back problems that now prohibit him from working. Doctors have performed surgery on it before, and now he may face another surgery. Please pray. In Peru, missionary Wilber Huillca Quispe is especially concerned for the indigenous people groups who live in the jungle. He and others have initiated ministry among some of these groups. Please pray for the salvation of souls. Please pray for the family of Pastor Almond in Central Asia. His son Samar accidentally electrocuted himself at home and died. However, Samar had recently repented of sin and put his faith in Christ, which has provided many opportunities to share the Gospel. Because floor hockey requires little equipment, it’s gaining popularity in Ukraine. Some of our church planters see potential for evangelism through floor hockey teams. They plan to try it, first in Gongarovsk and if successful in Desna. Please pray that God will guide and bless if this is a worthwhile means of touching others with the Gospel. Warm greetings from the Slobodians! This months video update features Igor Fomichov, our national missionary in the military city of Desna, Ukraine. This military base community has been drastically affected by the war going on in Eastern Ukraine. Many soldiers from Desna have been deployed there along with tanks and other military equipment. Though exact numbers are secret, it is no secret that there have been many lives lost and casualties suffered. Please pray for the Fomichov family and this church in Desna as they serve the Lord in this community which is going through difficult times. Greetings from the Slobodians! We are glad to update you on how God is using the prayers and support you invest in this ministry. Praise God for how He answers prayer and blesses these efforts. For example, our brethren in Belarus have reaped a harvest of souls through evangelistic meetings they recently conducted despite some of the key participants being involved in a serious car accident. However, they are being subjected to recent pressure from the authorities that have been raising issues concerning their legal status. Please pray for wisdom for Nikolai and his brother Valerie as they deal with this situation. Pray as well for the baptismal service for 8 of these new converts which provides yet another opportunity to preach the Gospel to the lost. Thank-you for praying for Amy, Steve and I as we participated in Ukrainian summer camps in July. The first camp was in Bilogorodka, Ukraine and was held on the grounds of the church being built. Even though the building is not complete, it was ready enough for this event. The neighborhood was canvassed and many invitations were printed and handed out. None of us had any idea of what to expect. Praise God that 80 children and youth attended, most from walking distance from this new church! Many parents attended the closing ceremony and expressed gratefulness for the camp and listened attentively to the Gospel that was presented. This turned out to be a very good advertisement for the new church in this growing community. The other camp was a youth camp conducted by the church in Ternopil, Ukraine that was held in the Carpathian Mountains. What a beautiful setting for the 40 city teenagers who attended mostly from un-churched homes. Praise God many made salvation decisions, which was one of the goals of this camp. Another goal was that this effort would open the doors to reaching the parents and other family members of the youth who attended. God answered this prayer as well as a good number of the parents of these youth have signed up to attend the churches family camp which is coming up soon. Please pray that whole families would be saved and added to the church. In Desna, Ukraine our church planter Igor Fomichov received a phone call from a couple that had just received one of the handouts church members were distributing for their upcoming camp. The wife recognized Igor’s name on the flyer since years ago (before Igor was saved) they were part of his drug-dealing crowd. She had heard Igor had gotten religion, dramatically changed and was even a pastor! As it turns out their lives were so ruined by drugs that several drug & alcohol re-hab centers could not help them as they narrowly survived one overdose after another. They had given up and were sitting at their kitchen table discussing how to end their lives when they received the flyer and made the phone call. They begged Igor to meet with them right away. That resulted in them eagerly receiving the Gospel and turning to Christ! Praise God! Please pray for this couple, Lena and Lyova as they are now attending church and rebuilding their lives for the glory of God. Please pray for our brethren in Russia as they must deal with the new anti-religious legislation that has been put into law there. They tell us that it is too early to know exactly how these new statutes will affect them but it is a real possibility that Christians there may once again have to decide between obeying God or Caesar. We plan to meet with them once the effects of this legislation become clearer. May God keep blessing each of you!